North Korea's young leader Kim Jong Un today ordered his missile batteries to prepare to launch against U.S. and South Korea targets, the latest act of belligerence that has left the United States and the world on edge in recent weeks. But despite Kim's menacing posture, the U.S. military recently wargamed a different scenario: how many American troops would be needed to go in and secure North Korea's nuclear arsenal if Kim's regime collapsed. 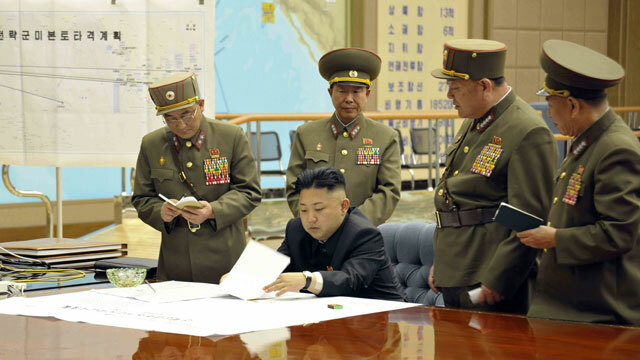 That was the objective this February when the U.S. military played out its Winter Wargame, that the autocratic rule of Kim Jong Un unraveled either from civil unrest or a challenge to his power and his arsenal of nukes was up for grabs. It's a scenario that some believe is more likely than a North Korea attack on the south. "North Korea has relied on these time honored, very effective tools that dictators have wielded all over the world, and what we know about these tools is that they work until they don't," said Jennifer Lind, a Dartmouth professor who has studied potential missions to North Korea. Recent years have seen the sudden collapse of dictatorial regimes in Libya and Egypt, and Syria is now in flames with control of its chemical weapons in doubt. "A regime collapse is always on the table, and we are in an uncertain period of leadership transition," said Rodger Baker, a geopolitical analyst from Stratfor Global Intelligence. In a war game focusing on the fictitious country "North Brownland," military experts from the Army's forward-looking research arm, the Concept Development and Learning Directorate, assessed how many U.S. troops it would take to go into a North Korea-like place to secure the weapons after a crisis erupted, and how quickly those weapons could be secured. According to Maj. Gen. Bill Hix, who oversaw the war game, American troops would have to enter the country by air and sea, locate nuclear material in enormous storehouses and unknown underground bunkers, and figure out how to wrest control of nuclear materials and stop reactors. The challenges, Hix said, are significant. "We looked at this issue of countering the proliferation of weapons of mass destruction, specifically nuclear weapons, and fissile material, and the data and the scientists associated with that kind of enterprise," Hix said. Hix declined to discuss the game's conclusions, but he cited studies that determined that nearly 100,000 troops would be needed to storm the country and secure nuclear material, and that the armed forces are still in need of nuclear experts who could help with such a mission. "There are obviously many people in the U.S. government or the U.S. who are experts in nuclear reactors or whatever, but not paid to work in a hostile environment where someone is trying to kill you while you are trying to render safe a reactor or fissile material," the general said. Defense News, which first reported on the wargame, said it took U.S. troops 56 days to get into the country and secure the weapons. Lind estimated that the mission would need up to 200,000 additional troops to carry out other aspects of stabilizing the country, including efforts to feed citizens, and locating and disarming conventional weapons and artillery. Those levels would exceed the peak number of troops in Iraq, which was 165,000, and the peak for Afghanistan, which was 101,000. "Can we get the job done? I think the answer is yes," Hix said. "Can we do it at the speed that may be required right now? I think we're challenged to do that." Experts said the U.S. began taking seriously the possibility of a regime collapse in 2008 when the former leader, Kim Jong-il, had a stroke. The concern grew when Kim Jong-il died in 2011 and son Kim Jong Un, who is believed to be 30, took over. Lind said that though Kim's recent statements have been more frequent and more antagonistic than usual, it would make little sense for North Korea to launch a strike now. "I don't believe war is coming because North Korea has no rational reason for starting a war which would lead them to no longer exist," Lind said. "I think the number one mission for the U.S. is to defend South Korea against a North Korea invasion, (and) over time that's gotten less and less plausible," she said. "Second is these collapse scenarios." "When we think about collapse, we worry about all of that [nuclear material] being flung to the winds and accessed on a global black market," Lind said. "Then of course the nightmare scenario is a terrorist group gets hold of fissile material, or a weapon, or one of the scientists that shows them how to make a nuclear weapon." Gen. Hix noted that the military is constantly preparing for any crises or scenario it may face in the future, and both he and the other experts agreed that a North Korean collapse is not visibly imminent. "If we look at various factors, I wouldn't say there's any particular indicator that we should be worried right now, but this could change in a matter of days. We could see a collapse and then be speculating for decades," Lind said. Baker said that though the probability of a collapse was higher than that of North Korea attacking another country, he expected Kim to continue leading the country, with its economy limping along, in the near future. He said he ultimately expects Kim to begin to open North Korea to the rest of the world.